An upscale community here at Oklahoma City is Glen Eagles Estates. It is located on the southwest corner of NW 150th and N. Western Ave. in Oklahoma City. Expansion of this exquisite neighborhood began in the 1980’s and the last home was completed in 2005. There are 246 homes in the neighborhood and has a total population of 658 people. The most common commute method is driving to work and the average commute length is 25 minutes. Glen Eagles is in the Edmond school district. Top-rated schools servicing the community are, Charles Haskell Elementary, Summit Middle School, and Edmond Santa Fe High School. 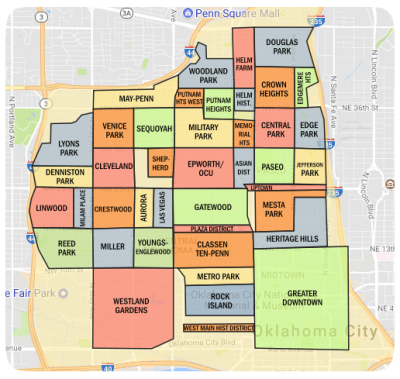 Glen Eagles has a significantly higher percentage of people with a Bachelor's Degree than Oklahoma City and Oklahoma County, which suggests that this is a very well educated neighborhood. 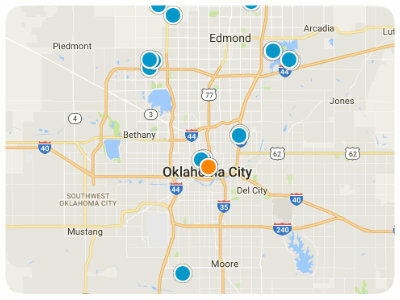 The housing market in Oklahoma City has something for everyone, whether it is ownership or rental. Oklahoma City is made more interesting by its family- and kid-friendly attractions that will surely cater to the youngsters, or just the young at heart. Another engaging and appealing aspect for the residents, tourists or visitors is the cost, because hotels, restaurants and boutiques, high-end or not, are not nearly as pricey as they would be farther east or west. Your trip and visit to this amazing city will never be complete without a visit to POPS located on Old Route 66 in Arcadia. The 66-foot-tall soda bottle out front will pretty much welcome you to this awesome place. There are approximately 600 ice cold options to choose from here that is POPS-picked from around the world, from South America’s Guarana Brazilia and Austria's Almdudler to Hawaii’s Waialua Pineapple Soda & Oregon's Hot Lips Sodas. They have 60 varieties of root beer, 40 cream sodas, orange juice, coffee, tea and hot chocolate, mouthwatering chicken fried stakes, tasty burgers and sandwiches with a wide selection of toppings and sauces. Be sure to take your camera and plan your trip so that you’re arriving—or leaving—at dusk, and watch the giant soda bottle light up against the night sky. While you are here, do not miss visiting Chesapeake Boathouse, a spectacular architecture on the banks of the Oklahoma River where the 2010 American Collegiate Rowing Association Championships were held. Designed to look like a rowing shell, the translucent building appears to float on the river at dusk. Another one of Oklahoma City's most famous and prominent tourist destination is The Bricktown Canal. It is man-made and was modeled after San Antonio’s River Walk. There are restaurants and shops nearby and along the canal, but the real draw is the people-watching. Always upbeat, this is a great place just to hang out.